Meet Bernadette. If you have knit Miranda, then you will definitely see the similarities between the cables in these two scarves. They both use the same BC and FC cables. Like Miranda, Bernadette is also a good cable scarf for mindless TV knitting because you spend most of your time doing K2P2 ribbing with a few cables every 8th row. The pattern is very easy to memorize too. You can even do the cables without a cable needle, although it is just a smidgen trickier than a regular straight cable (CF6, CB6, etc). The pattern is the Lattice Cable from Barbara Walker #1. I have all 4 of her Treasuries and spend way too much time browsing through them and getting inspired to knit all sorts of things I never have time to bring to fruition. 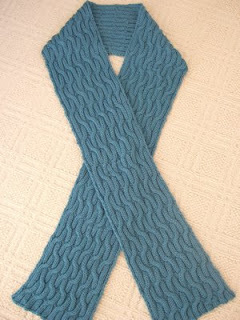 I knit this scarf using 5 balls of Elann's Superwash Merino yarn, color is Capri Blue. This was my first time playing around with this yarn and I was extremely and pleasantly surprised to find out how soft it was. This yarn is soft, soft, soft, soft, SOFT!!! I can't get over the fact that it is machine washable! I think I like this yarn even more than Zara. I wish this Superwash Merino came in as many colors as Highland Wool, then I would be a happy camper. And I hope the yarn doesn't become discontinued like their Devon, which I discovered too late to add any significant amount to my stash. The pattern is a bit "scrunched" when you knit it, and some people may prefer the way that looks. If you don't, then the scarf will benefit from a bit of blocking afterwards to allow the pattern to bloom. This scarf is approximately 8 inches x 80 inches (~ 20 cm x 200 cm). Of course YMMV depending on how wide or long you decide to make your scarf. 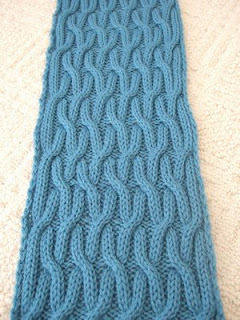 If you want to change the width of the scarf, just cast on more or less stitches in multiples of 8 + 2 stitches and then add 2 stitches for the border (one edge stitch at the beginning of the row, one edge stitch at the end of the row), viz. 20, 28, 36, 44, 52, 60, 68,76, etc. My first attempt at creating a chart (for the Osiris Scarf) for the chart knitters was a challenge for me using the Aire River Font due to its limitations, especially for representing cables. 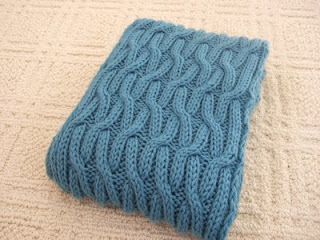 So I sought an alternative for this scarf, trying out this Knitting Chart Maker. I still had to jump through many hoops in an attempt to get the output in some sort of usable format because I couldn't figure out a straight forward way to save the result; their instructions to select all, copy, and then paste into a notepad document did not work for me. The output was not pretty. I'd be interested in hearing any hints for using this chart maker. I had put the chart here for anyone interested, but decided to remove it because it really was not very good to look at, not because the chart maker output is bad, but because I am not very good at creating charts. I am not a professional pattern writer, and I sure as heck don't know how to create a proper looking chart. I was just playing around with this chart maker to see how it worked. 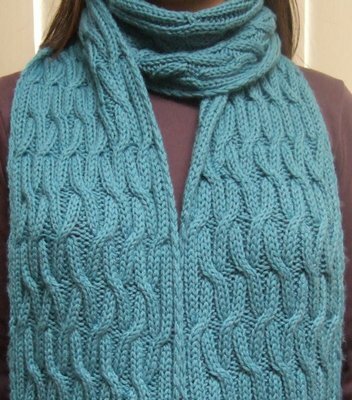 The scarf pattern is so simple, you really don't even need to refer to a chart. The pattern is very easy to memorize. Lattice Cable, BW1 pg 276. Thank you for pointing this out. It should read "Work the following sixteen rows" instead of 3. I've corrected the text above and also the PDF documents.